Fortunately, the veil of secrecy surrounding the Fukushima catastrophe is lifting, but the accuracy of the news about the severity of the fallout is hard to decipher. It’s emotionally exhausting for so many people, especially in Japan, Hawaii, the Pacific Islands and here on the West Coast of North America. What is actually true? Is it safe to swim in the ocean on the West Coast? Are all fish in the North Pacific contaminated? Unfortunately, attempts to ascertain the true consequences could take years. I do know from my own research that there is no absolutely “safe” place to go once nuclear radiation is unleashed. Some places are more intense than others, but years ago, as a journalist studying radioactive waste disposal in the oceans, I saw firsthand how Japan’s waste flows through the Pacific Islands around the world. Wind and water circulate around the globe, from one hemisphere to the other, with stunning thoroughness. We all live downstream. I also know without a doubt that nuclear power is unquantifiably and unjustifiably dangerous, and no new plants should be built. And yet in 2012, after the Fukushima accident, President Obama lifted a 30-year moratorium on building new plants in America. Five have been green-lighted. Over 60 reactors are currently slated for construction around the world. You can help stop these facilities from happening, and avert another disaster. Nuclear power plants get built with loans from major banks, and the banks make these loans with money they get from your deposits. Bank of America, Wells Fargo, Union Bank and Union Bank of California, Chase, US Bancorp, US Bank National, Morgan Stanley, US Bancorp, Credit Suisse and US Bank National are the ones using your deposits to fund the companies behind the new reactors in the US. If your credit card has a logo from one of these banks, then every time you use it, or make a deposit, you are personally underwriting the potential destruction of everything you hold dear. I invite any of you outside the US to look up what company is funding the plant in your country and publicize it here. Here is a step-by-step guide on how to follow the money. According to physician, author and long-time anti-nuclear advocate, Dr. Helen Caldicott, “No dose of radiation is safe…and all radiation is cumulative” in the body. Albert Einstein was quoted saying “nuclear power is a hell of a way to boil water.” Indeed, nuclear is just that, a way to boil water to create steam. It is the most dangerous and expensive way to generate electricity. Why should we risk all life on Earth by unleashing the most dangerous pollutant ever discovered when there are safe, sustainable and cheap alternatives, including “New Energy” technologies that we are helping to develop through Thrive Movement? Already California’s annual installed capacity from solar is nearly twice as much as the risky, Diablo Nuclear Plant. A comprehensive study found that nuclear reactors are much more costly than other alternative energy sources such as biomass, wind, geothermal, and some solar and conventional fossil fuels. The government subsidies that nuclear power relies on come from taxpayer dollars without taxpayer consent. The burden of clean up (which we can see is insufficient even when undertaken) falls on taxpayers as well, since there is a limit on how much liability any private insurer will take on for nuclear fallout. None of the government costs — which means, “taxpayer-subsidized” costs — are included in typical discussions of nuclear viability. When we made THRIVE, we had two fact checkers who spent months researching every claim so that we could be 100% confident of our assertions. As a result, the only claim of inaccuracy was that we labeled a photo with the wrong generation of Rockefeller. We haven’t had fact checkers verify all the information flowing about Fukushima, so I can’t vouch for the absolute accuracy of the different reports. I have nonetheless included some of the ones I’ve found most helpful to me so far. 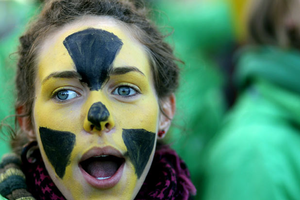 What I do know is that we can act now to help stop further risk of nuclear destruction. And no matter what, that is a smart and timely thing to do. Get informed and spread the information to your friends, family and social media networks. Start here. If you bank with one of the lenders mentioned above, move your money to a local bank. Here’s how. If you take part in the political process, make nuclear a campaign topic and require candidates to pledge an end to nuclear funding before they get your vote. Sign and circulate the petitions below to let the world know we are watching. If you have access to a Geiger counter, take readings and send to Prison Planet TV, Infowars.com or Safecast.